By M. Shanken Communications, Inc. Seller: M. Shanken Communications, Inc.
© M. Shanken Communications, Inc.
I’m already a subscriber to WS and I thought this would be a nice complement to the magazine so that when I’m at the wine store, I can look for the ones I’ve flagged as interesting. But $3 per month for the app when I already have the information I need through purchasing the magazine seems silly. I would have possibly paid a one time fee of $10 or $15 but I’m not paying for yet another monthly subscription. I was really hoping for something better. Amazing app! Can't recommend it enough for anyone interested in learning abt wine. I found the app so useful, I especially like the new profile section to keep track of all my wines! Always great to learn from the best. Big fan of this handy app and Wine Spectator! The app is such a great, trustworthy resource. I use it all the time when buying wine in stores or ordering in restaurants. 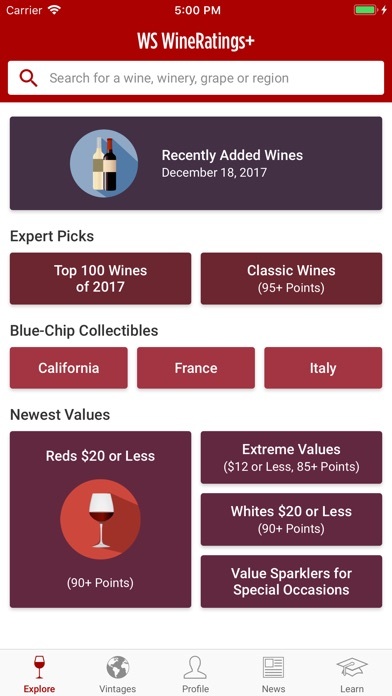 Whether you are a wine expert or new to the category, you will love this app! Helps me with my decisions when I’m at the store buying for myself or trying to impress clients at dinner. I don’t trust any other wine reviewer - Wine Spectator is the best and my most trusted! It’s always fun to learn about wine, but nowadays there’s too much information out there. Wine Spectator is the industry standard, so it’s great to learn from the best! This app has proven especially useful when I am at a restaurant with a long and overwhelming wine list. Through just a quick search I gain the confidence I need to order a bottle that might be priced a bit higher than I normally get. Also really liking the new personalized section. I cannot access the site after the 4/19 update. There is no way to communicate with the developer. This app has been around forever. If you look at the reviews some of them stretch back 7 years. I've used this off and on during that time, and it's gone from a borderline useless app to one that is pretty useful. 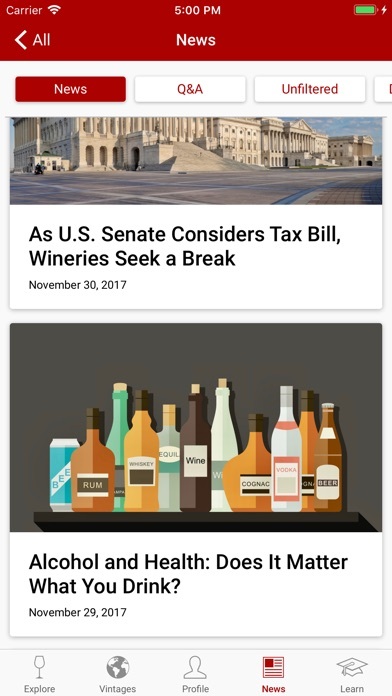 I agree that the WS subscription model requires you pay separately for this, print magazines, and online access, but that aside this app is worth a few bucks a month if you buy wine regularly. Many times ratings labels in stores are for different vintages or releases, so it's good to double check. My one suggestion to improve this app would be to filter based on number of cases released. Many of the higher rated wines have very limited releases so it would be nice to sort out the ones you know you won't ever find in the local stores. Also adding the ability to filter multiple years. Currently you can only filter by one year at a time. I have been using the newly released app for a week now, and I think it's tremendous. The search feature is so well done, allowing both casual browsing and laser-focused precision. I'm a fan of WS wine critics and scoring as well, so this app is ideal for me. Pretty much worthless unless you want to spend $2.99 per month for the paid version. Deleting the app now. Won't work. Can't find it. And you want to charge monthly? Fix your issues or take it down. It's really aggravating to pay for something you can't use. Looked up Ca wines, couldn't find a single named bottle in the free content? Found some weather and soil reports. I lived in Kenwood, Ca. Was hoping to find some Winery listings, and recommends first, before I upgrade app. Look yourself. I held off for a long time upgrading to all of the reviews. Long story short, it's the best wine app for getting quick info that will help with your buying decisions. For the cost of a bottle per year :). I hate wasting time in the grocery store or wine shop looking up wine info. It can be slow and frustrating. This app makes it fun and quick. This app helps me navigate through Wine Lists and store aisles to find the best wines and best values. Love the info in this format! While I have a subscription to the magazine and website, I love how handy this app is. I can't tell you how many times I've pulled this app out when I'm in a restaurant trying to pick out a bottle of wine. Especially when traveling abroad recently, when I didn't recognize a single bottle of wine on the list (and I usually feel like I know my way around a wine list). It was so helpful to have this app! My other favorite use is to mark "favorite" wines and then I have a shopping list for when I go to a wine shop. This app is basically useless unless you pay $2.99/mo. That's not worth it to me. I found the app to be fairly useless without the subscription. It's better to search the Internet using Google or Bing. It takes months even years for them to update their vintage charts. e.g the current version has Napa Cab back at 2010! Get with it WS - we are in 2014 and the 2012 cabs are shipping. I tunes won't install because it says it requires a newer version of the software and Apple says I HAVE the latest version. This is the 3rd program that did this. I would have thought this would be free for print subscribers yo magazine. I can't believe I can't use this app with my "online account"
How completely moronic is it that I pay for a dual account for the magazine as well as online access, and I cannot use their own app??? So for the price of $2.99/month this app saves me the trouble of going through a Mobile browser! Ridiculous , I'll be ending all accounts with this asinine company! Gaps. Not a ton of coverage for recent vintages. Basic, not overly impressed. I sell wine in Texas and downloaded the app to help. But when sharing the accolades I wish that what was being sent was an attachment that I could print and place in my accounts. I think the website allows me to do this? Does anyone know if my subscription for the app works on the website? Online subscription doesn't include this?? F- on that. I pay for the online subscription and already get this content but I need to pay $3/month to get the same thing on the app?? Probably won't even renew my online subscription if this is how they want to do business. This is almost what an app should be - access to a vast database at exactly the time you need it: in a restaurant or a store. My only quibble is that it seems to take a bit too long for the database to be updated with new ratings from the magazine. Fix that (and improve the search function a bit) and it really will be perfect. The app is very helpful at wine shops when you are not sure what to buy. 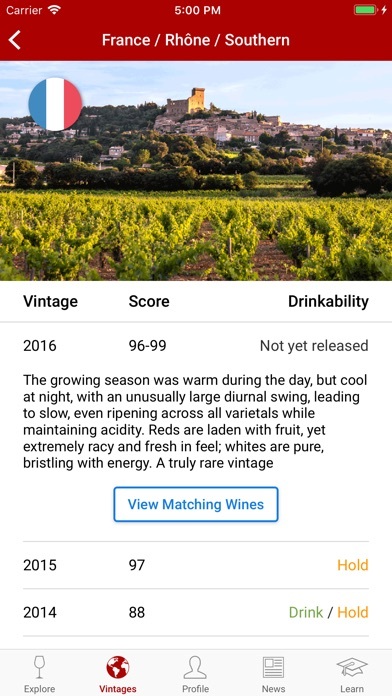 You can read ratings and tasting notes with you iPhone right at the spot. This upgrade offers quite a lot of useful data in an easy-to-use format, with an expanded Feed that has lots of additional articles. And they've added more info to the vintage charts; I’d like to see them continue to expand this area. All the reviews you get are quite a bargain for the monthly fee! This is a good app to reference while shopping for wine. However, the addition of a considerable amount of wine info would make this app great, info that includes more regions and types. In addition, when a person pays $2.99/mo for an app (with no annual subscription available), they expect premium content (i.e., pictures and video). And apps in 2015 should be optimized for iPhone 6/6+. Looks hideous. Can't you come up with something better? I'm a subscriber to the print and online Wine Spectator magazine...$75/yr for that privilege. Astounded that my membership isn't enough to get me access to even basic info via the mobile app. Very sad. So I'm growing from a novice wine buyer and consumer to someone who is buying to both drink and age at home. If I had this app a few months ago I would not have been bamboozled by that awe full Vivino app as bad as I was. A must have guide. Sure, you have to pay for it to unlock the real potential. 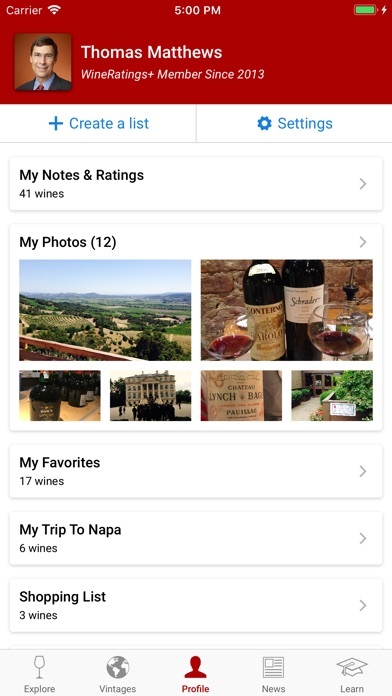 But for the wine professional, or wine buyer, this app is a "go to." Every time I'm buying a new wine, and sometimes when I'm selling it, I refer to this app. It has definitely paid for itself. Why do you have to pay a monthly fee when you subscribe to the magazine? This app is so deep, I love how much better I can enjoy and understand wine. This is a must app for both the beginner and experienced wine drinker. When it worked I'd give it 4 stars. However, for the past couple months it fails to search for any wines. 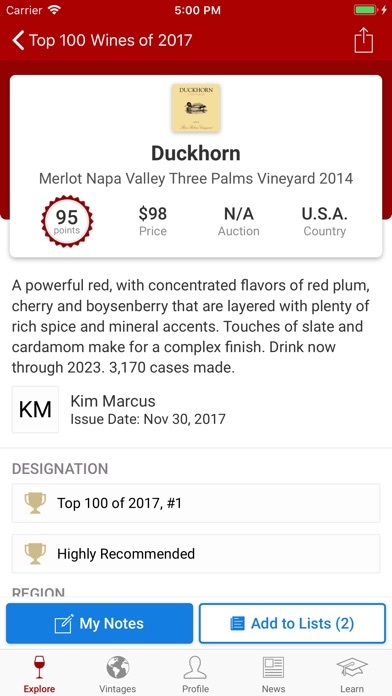 Also, if I tap on a wine under the top 100 picks of 2014, the wine name pops up but the content never loads; you just get the loading symbol that goes and goes and goes. Since I'm paying money for the subscription, it would really be nice if it worked. No app update or bug fixes since Jan. 2015. This is a good and reliable resource that is easy to use. I wish it carried a broader variety of wines. Facebook issues. But LOVE this app! When I had this app on my iPhone 5s, I could upload reviews to Facebook instantly, now no sharing options go through, and Facebook isn't even listed. Is anyone else having this problem? I am an avid poster to help spread the word of the amazing wines in this world, I would like to continue to do so. I use this app every time I'm in a restaurant or wine shop. Really improves my chances of finding the right wine. Ignore all the crybaby people who complain that the app costs money. If you want value and quality, you pay for it. Obviously. You want free, crappy reviews from non-experts, have a good time. You want discussions and ratings from world renowned connoisseurs, pay for the app. On that same note, the free content has many wonderful articles and expert advice. I have removed one star because there is confusion about what content is on what source and there is no way to get an easy answer. I want to be able to have one source, pay one fee and have access to everything. 2.99 a month? Virtually no info without a paid subscription? Don't bother! Horrible. I won't pay for a subscription to be able to search. I agreed to have advertisement of wines and related or suggestions, so get paid by the advertisers , not me the end user. Not agreed, so already deleted and happy using another app. I love the concept, but for some reason, the only wines available to me are an Australian one called "Blood of the Elderly" and one from California called "Capri-Sun Pacific Cooler." Do I have to buy the pro version to unlock the other wines? Wine Spectator is my go to for making great choices and purchased. This App is my shopping companion I don't buy without it. Great App for wine lovers. For $2.99 / month you can search the rating database for a specific wine. You cannot search for general characteristics like “Napa Cabernet > 90 pts and 2007, 2008, 2009”. Additionally, there is no local database so you need a good net connection and patience. If you’re in a wine shop and don’t have a good connection (all that wine does absorb RF signals) you’re out of luck. It’s basic. And of course their brilliant marketing program means you don’t get access to the wine database on the web, that’s a separate subscription. This is strictly iPad/iPhone. I’d like an app that helps me in the store, and in a restaurant. A 10yr old California Chardonnay that only produced 300 cases is not relevant! The updates to this app are a big improvement and there are new wines added regularly. Very useful when I am looking at a wine list in a restaurant. Not great, but not bad. Does not have all wines and vintages but general information. WS has separate subscriptions for this app $36, WS online $60, and WS magazine $50. Each has overlapping content but different services. Type-in versus barcode or label-scan search is a major drag. They hide their real prices: its a monthly fee! They state the pro version is 2.99. However, if you read the terms, it says a monthly subscription of 2.99. Pretty deceptive. Removing. I use this all the time. Well worth the subscription fee. Occasionally wines that are on the shelves are not in the database. Why call it free when it isn't? Just be up front and say the app is useless unless you buy the $2.99 library. Or a subscription. Deleted and decided to stick with Vivino. Its a great idea, similar to Leafly BUT you cant really use any of the features without doing a 30-day free trail. Meh. I use it constantly to find ratings for wines I don't know. It's fast, intuitive and hasn't let me down yet. The old version was better. I pay full freight for this content happily. But recent design changes have added more work for the user to find what they are looking for. What used to be a good autocomplete on a character by character text entry has, with the latest design, made the user work harder to find what they are looking for. Frustration. Bring back the old interface. I use this app every time I go wine shopping. It has easily paid for itself in steering me away from poor and often expensive wines and towards less expensive more highly rated ones. Sad that this is "free" when you download but there is absolutely nothing you can do with it without adding the paid subscription. Going with Vivino. Not a week goes by with me using the WS app. You have to buy the subscription if you want to use what it advertised. Tons of value and great refreshing update! I was pleased to see an update to this app. The subscription fee was always making me wonder if I should continue. Well this update is great. Way more features and I love the news feed. Great work! While I agree with others that the content should come free with the print and online subscriptions, the app is very easy and quick to use in restaurants and other situations where you want a quick check on a couple of ratings. The app is very easy to check and the database is extensive. Handy. Does what it says it does, and is quick and free from obvious bugs. Had to pay just to save a list of favorites. No thanks. 36 bucks a year. Free version useless. Not for me.